Mostly below vessels in the northern pacific ocean. The University of Alaska Juneau (UAJ) first adopted the humpback whale as its mascot in 1980. The whale was retained after the restructuring to University of Alaska Southeast (UAS) in 1987 to include the Ketchikan and Sitka campuses. 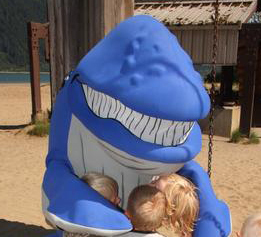 A student contest was held to name our humpback whale mascot, who has been known as “Spike” ever since. Many campus servies are named in my honor as well as the UAS Facebook Page, Spike Whale Southeast. By appointment only. I often crash events!